Mental training for insomniacs on mp3, to help produce more SMR brainwaves that are important for sleep. Also good for focus, attention, anxiety and depression. Sensorimotor Rhythm (SMR) represents the brainwave frequency range of between 12-15Hz. EEG researchers have found that insomniacs tend to have a lack of SMR waves in the brain. The concept behind this session is to help train your brain to produce more of these rhythms, with the aim of helping you to fall asleep better and stay asleep for longer, without regularly waking up during the night. 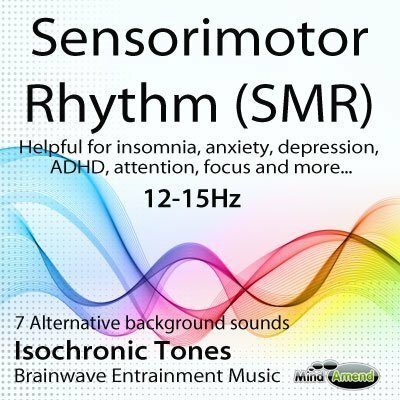 Listen to this SMR session regularly over an extended period, to help train your brain to naturally produce more sensorimotor waves, and inhibit body movement during sleep. This session is not designed as a form of sleep induction, so it should be listened to earlier in the day, not when you go to sleep. The Sensory and Motor Strips in the brain control the sending and receiving of messages about movement, to your arms, legs, shoulders, hands, feet and other parts of your body. SMR is involved in inhibiting movement during sleep, which is why low levels of it are linked to insomnia. Regular exercise and physical activity are known to increase SMR levels in the long term. Athletes, dancers, swimmers and people who are generally active, tend to have high levels of SMR activity in the brain. ADD/ADHD – SMR Is good for concentration and focus – People with ADD/ADHD are often found to have very low levels of SMR waves. If you are suffering from depression, you are likely to be producing a high amount of slow wave, low-frequency brainwaves. It can be helpful to stimulate your brain with higher frequency isochronic tones and bring your dominant brainwave frequency up to a higher level. One drawback if you go too high is this might invoke feelings of anxiety, which can often be linked and associated with some types of depression. The advantage of stimulating to the SMR range of 12-15Hz is that it's a good mid-frequency range, that will help give you some balance. If you have feelings of anxiety, your dominant brainwave frequency will likely be quite high, so it will help to guide yourself down to the SMR range. So SMR should provide some relief for both anxiety and depression sufferers alike. Find somewhere quiet, close your eyes and begin to relax. This track can be played on loop repeat – The track starts and ends at the same 12Hz frequency, and so if required, it can be played on repeat. Headphones are NOT required for this product, but you may find the experience more stimulating if you use them, as it will help to block out external distraction.